Yesterday afternoon, prior to last night’s win over Twins, Aaron Judge hit on the field for the first time since landing on the disabled list. He took five rounds of batting practice. He’s gone through the usual progression of tee and soft toss to hitting in the cage to taking batting practice over the last week, and everything is going well. Judge feels good and is inching closer to a return. The Yankees have 18 games remaining and the regular season ends in two weeks and five days, so they no longer have the luxury of time. Judge has been out close to seven weeks now. It’s going to take him some time to get his timing back and get back up to speed at the plate. Hitting in the cage and in batting practice only does so much. There’s no substitute for live big league pitching. Triple-A Scranton begins the best-of-five International League Championship Series tonight and I guess that, if everything continues to go well, Judge could join them for a rehab game later this week. Maybe Thursday after this series with the Twins? Send Judge down and hope Scranton’s postseason series goes the full five games so he can play three rehab games? That seems like the best case scenario. My guess is Judge won’t join Triple-A Scranton for rehab games — that would be a very quick return to game action given how much time he’s missed and the fact he took batting practice for the first time just yesterday — and will instead go to Tampa for live batting practice against minor leaguers who are hanging around waiting for Instructional League begin. That could happen … maybe this weekend? I dunno. The Yankees and Judge really don’t have another choice here. He’ll have to rehab in big league games like Didi Gregorius. The rehab game situation is less than ideal. The important thing is that Judge is continuing to progress with his rehab work and is not having any problems. No problems except for the fact there is still pain in his wrist. “The pain is not gone. It’s still broken. It’s around (a four on a scale of 1-10). I can’t really give you a number. But it’s feeling better,” Judge said to Bryan Hoch over the weekend. Oy vey. Pain is bad. Pain is your body’s way of telling you something is wrong and Judge’s body is telling him his wrist is still broken. And yet, he moves forward with his rehab work, presumably because there are only so many regular season games remaining. It’s now or never. Either Judge starts his rehab work now and plays through pain (admirable but possibly stupid) or he doesn’t come back at all. Argh. This creates two questions. 1. Can Judge make the injury worse by playing hurt? Beats me. I’m not a doctor. I assume the Yankees are not throwing caution to the wind and putting their franchise player at risk of a more serious injury. 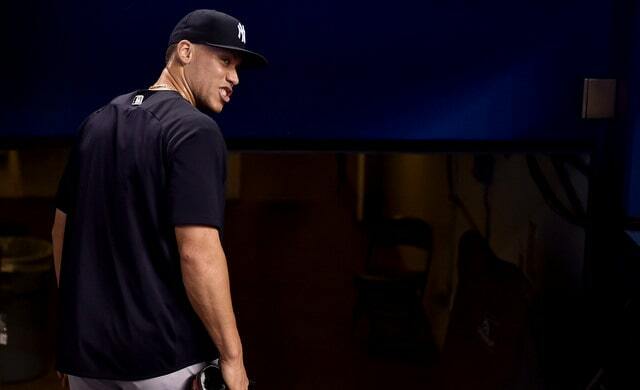 The Yankees have definitely rushed players back from injury before (coughGarySanchezcough). 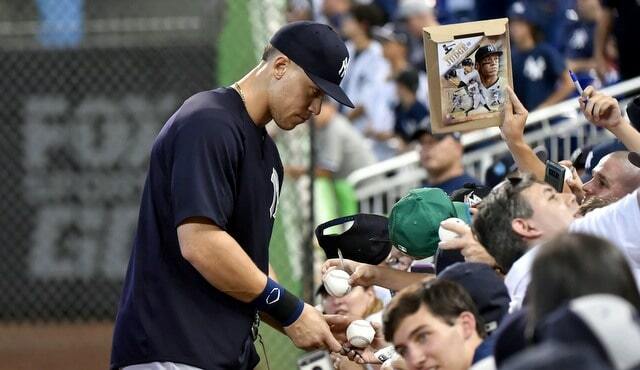 I don’t think they’d do it with Judge and with a wrist injury. These you don’t mess around with. It seems to me this is a matter of pain tolerance more than anything. If Judge can handle the pain, he’ll be fine. Remember, Andrew Miller suffered a similar chip fracture in his wrist a few years ago, when he was hit by a line drive in Spring Training. He got the okay to play as long as he could tolerate the pain. A pitcher hurting his non-throwing wrist is much different than a hitter hurting his wrist, and that’s why Judge has already missed seven weeks. At this point, enough healing may’ve taken place to allow him to play. I mean, that’s kinda what had to happen for Judge to begin swinging a bat. 2. Can Judge perform at his usual level if he’s still hurt? Probably not. And, frankly, at this point it will be tough to tell whether Judge is underperforming — if he does underperform, that is — because of the wrist injury or because he’s missed seven weeks and is being thrown right back into big league games. A seven-week layoff without a proper rehab assignment is a good way to make a player look silly at the plate. The Yankees don’t necessarily need Judge to play like the .285/.398/.548 hitter he was prior to the wrist injury. It would be nice, sure, but Judge only has to clear the “better than Andrew McCutchen or Brett Gardner” bar to be an upgrade for the Yankees, both down the stretch and in the postseason. Gardner is hitting .239/.327/.370 but he still has a lot of defensive value. McCutchen is hitting .148/.385/.370 in his limited time as a Yankee. One thing to keep in mind: Judge is really good even when he’s at his worst. Remember that miserable second half slump last season? Judge still had a .353 OBP in August. He changes the game just by standing in the batter’s box because he scares the crap out of pitchers. He’ll take his walks and still get on base even when he’s not launching dingers. I’d bet against Judge playing like Aaron freakin’ Judge when he returns. I’d also bet against him being useless. The McCutchen trade told us the Yankees have some concerns about Judge being able to return this season. Return at all and return at full strength. They hedged. Now Judge has starting taking swings and progressing with his rehab work even though he still has pain in his wrist. Boone said that would not be the case a few weeks ago. Judge was supposed to remain shut down until he was pain-free. What changed? The schedule. There’s not much time to get Judge back before the end of the regular season. It’s either start him up now and let him play hurt, or don’t get him back at all, and that would stink. As long as there’s no risk of a more serious injury — I assume he’d still be shut down in that case — then the Yankees and Judge might as well keep going. It’s unfortunate he will (probably) have to play hurt. This late in the season though, there doesn’t seem to be any other choice.